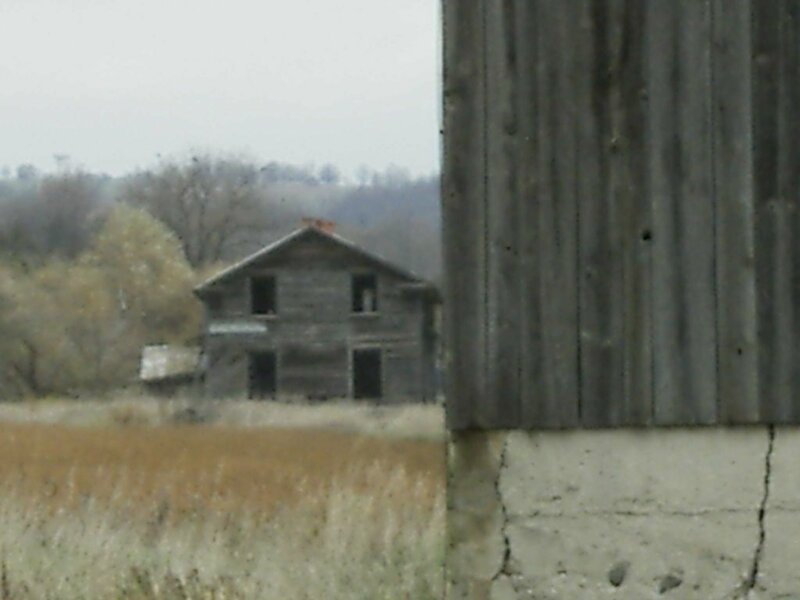 This is kind of how I feel about the abandoned farm houses when I am am there, seeing them and getting photos. 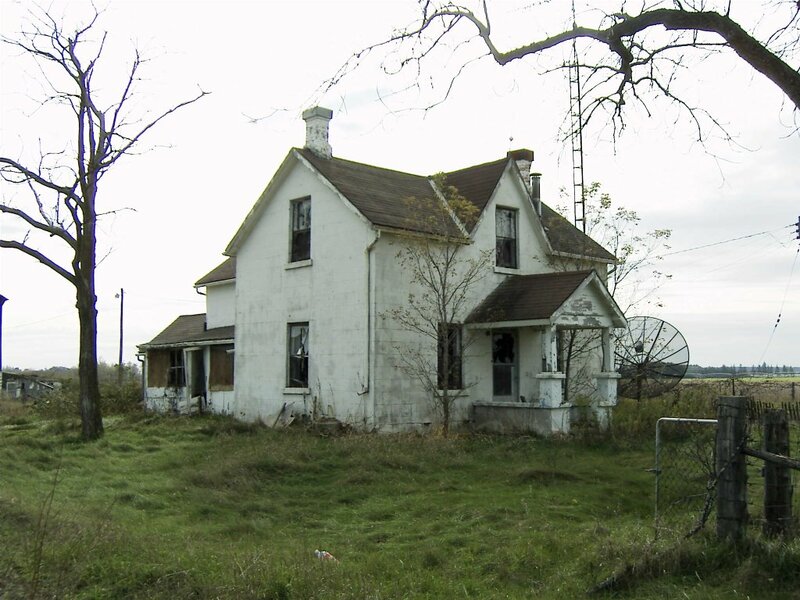 The CopySix blog has a really great post about urban exploration, the end of civilization and why those things interest some people, like myself. I wrote a comment, trying to put into words why I like the old, abandoned farm houses so much. For me it’s something about the people who built the places and how they had so much promise, hope, potential and now are left to the elements. I like to see both the man-made and the nature made as they come together. I love the old wood, stone and iron work and the way the trees, vines and wildflowers gather back in around. 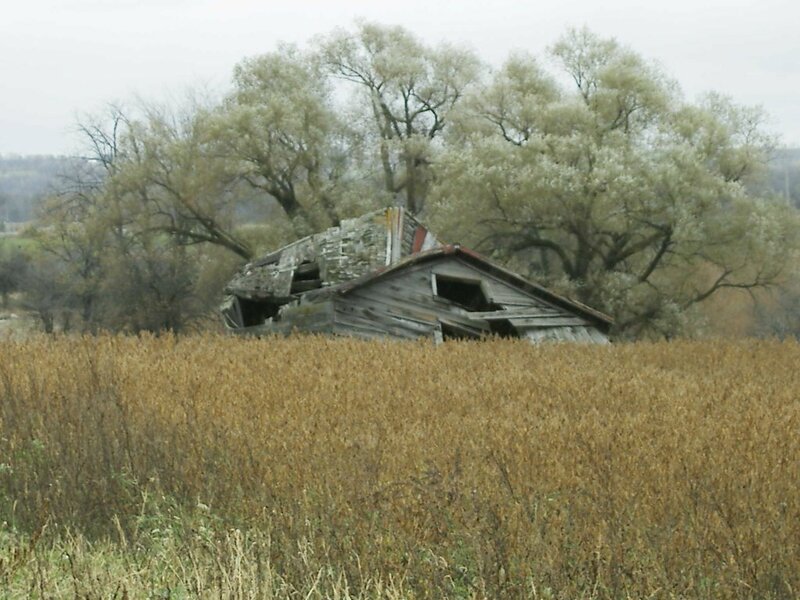 My favourite abandoned farm houses are those well seasoned, weathered ones. Reminders of what was, kind of a mystery, something forgotten. I think about it’s past yet also see it for the present. It’s like a courage, or strength to see those old places surviving the elements. Giving up parts and pieces of themselves to the battle yet still not fading out to nothing, not yet consumed by nature and the elements. 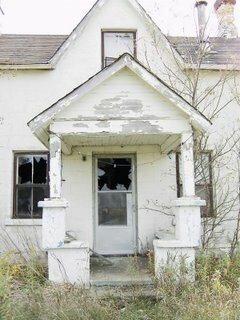 Not sure how this will work out as I have not done a lot between my photos on Flickr and this blog, but for the Thursday Thirteen here are 13 of my photos of abandoned farm houses taken in various locations in Ontario, Canada. 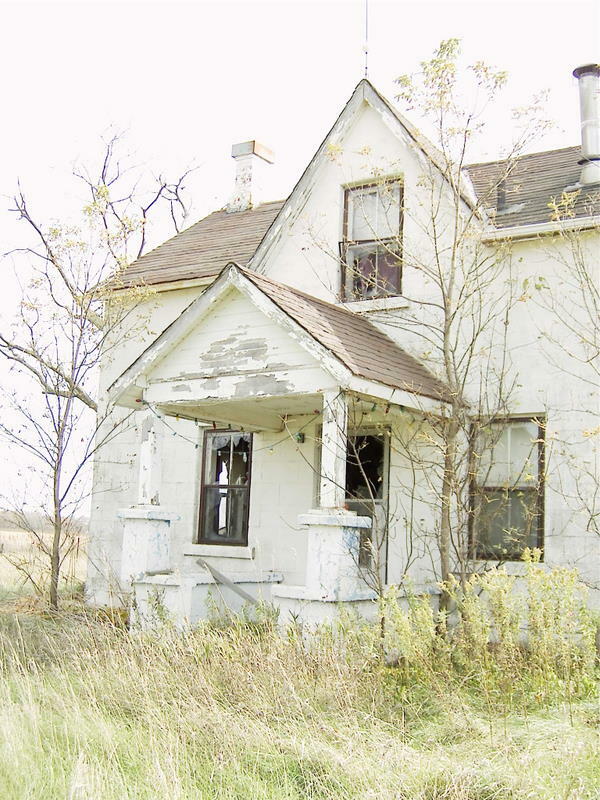 At the end of my rainbow is a pot of gold and a derelict, weathered and seasoned farm house. 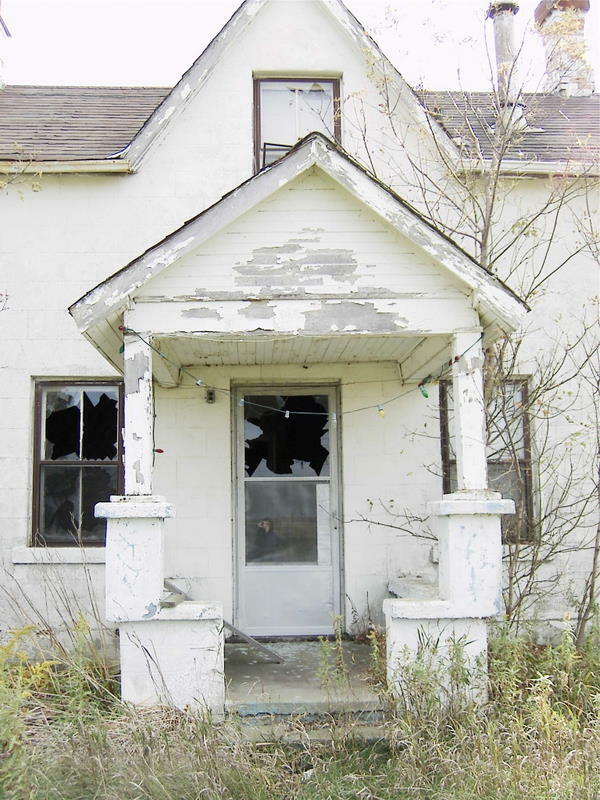 This house was along #89, not far out of the town of Conn. This was a house I had seen along the way to meeting Pete. The window frame/ ledge is made of pebbles. Really nice. I also noticed the kind of ridges they have halfway up the wooden walls. Too bad Pete wasn’t there to get a look inside. This one wasn’t a total ruin yet. 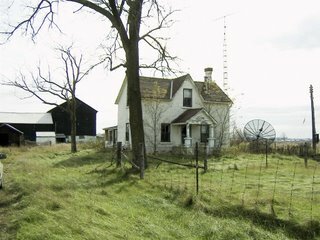 I’m sure it was abandoned, the drive way was weedy, yet not bad if you were driving farm machinery into the fields in back of the house. 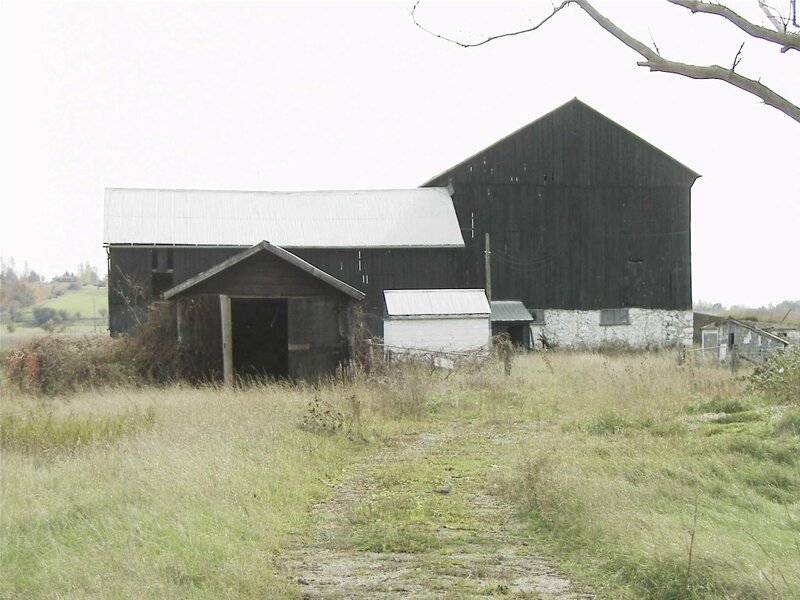 The farmhouse was quite far back from the barn and shed, without any kind of path or road to it I couldn’t get closer. I didn’t want to walk through the field and muck up whatever was planted there. Also, as usual, I wasn’t wearing good footwear for walking through mud, prickly weeds and whatever else inhabited the area. 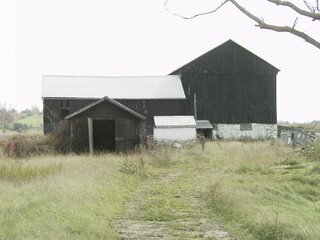 The farm was off a side road outside of Cookstown. I noticed it when we were driving on the #400. 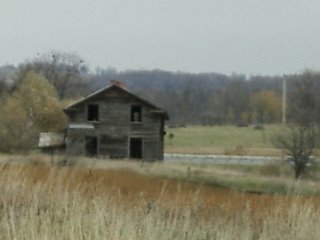 It is visible from the highway if you are looking for a dark old house in a field. The house is nearer the highway than the side road I drove to get there. 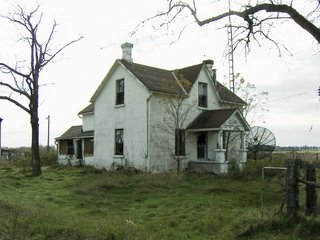 Maybe the house was approached by the road which was once the highway, before it became so huge and cut off the old farm. I would have liked to see more of the house. I drove around looking for another backroad but only found a road which ended at the highway, no exit. Maybe someone else with big boots to trek back there will get more photos. 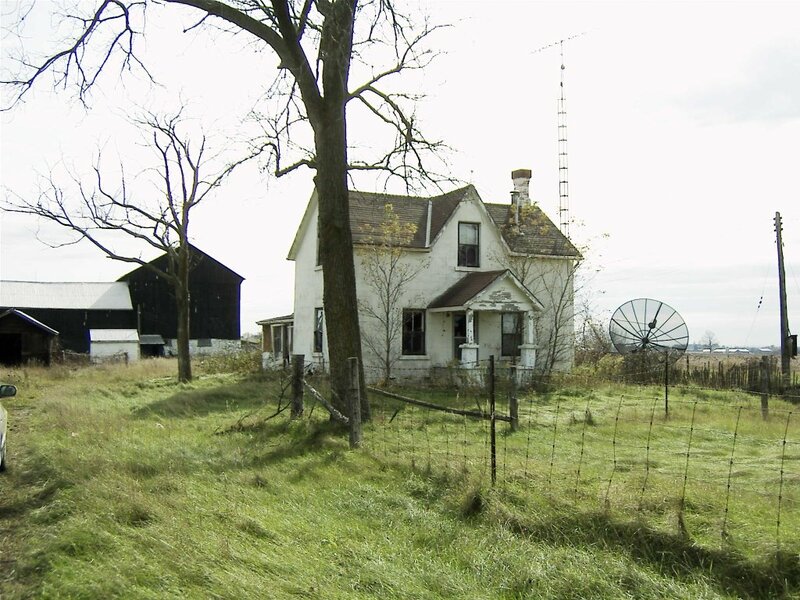 A white farm house with a black barn in back. Still had a satellite dish on the side of the house. It hasn’t been empty as long as some others I’ve seen. Likely the Honda plant bought the land as they are building extensions and changing the roads even to accomodate car manufacturing and traffic from all those employees. I found a red plastic kid’s size shovel just off the driveway of this house. I left it there but it wasn’t at all damaged. Not much other stuff around. The grass is all overgrown and really pretty. It would make grass lovers nuts, itching to cut it and manicure it into the perfect lawn. 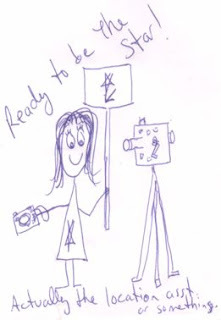 But, I already think it’s perfect. It fell over itself in waves, smoothed down by the wind and rain. It shows up in some of my pictures.